Developed by our mobile app developers, Jabrool is an on-demand package delivery apps solution, connecting customers and package delivery drivers in real-time. The solution, Jabrool, comes with customers’ app and delivery driver app to transport goods from one place to another. Jabrool is an on-demand package delivery apps solution that allows Saudi Arabia residents to get in touch with nearby package delivery drivers in real-time. Using Jabrool customer’s app, customers transport goods and other packages from one place to another place within the estimated time period. Moreover, Jabrool is one such package delivery application that allows customers to select the delivery type from Jabrool Budget and Jabrool Express as per their convenience and send it to anywhere across Saudi Arabia. In short, this application has made it easy for Saudi Arabia residents to transport goods and packages without any hassle. Based in Riyadh, Saudi Arabia, our client is running a big courier delivery business, allowing people to transport goods from one place to another. 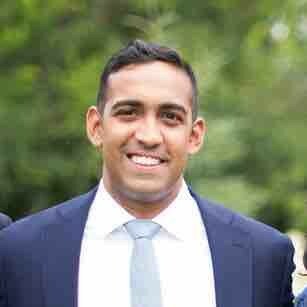 Along with courier delivery business, he has expertise in the IT industry, operations, and management. As he is running the courier delivery business from the last 8 years, he realized that the mobile app could lead to a revolutionary change in his package delivery business. In fact, he aims to be the leader of the digital delivery revolution by standardizing the delivery process through a mobile application. So, he decided to develop an on-demand courier delivery application that connects customers and package delivery drivers in real-time. Through the mobile app, our client wanted to enable Saudi Arabia people to transport package easily whether it is small, medium, or large. 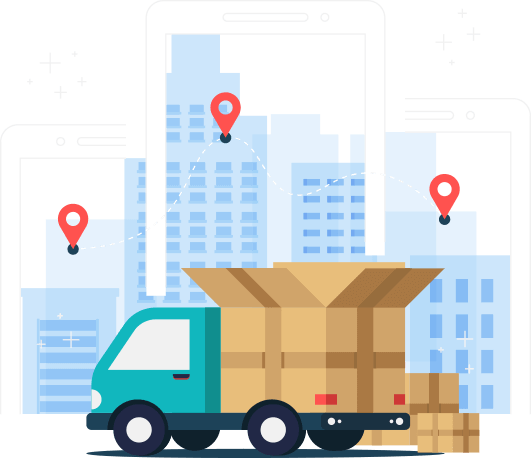 After deciding to make an on-demand courier delivery application, our client started looking for the mobile app development company, which turns his idea into a successful application. Initially, he found one mobile app development firm from Ukraine and decided to work with it. Then, the Ukraine based company started working on his project and developed one or two features, however, our client did not get the expected results. So, he decided to stop working with the Ukraine-based company and hire a better team of mobile app developers, which meets his business requirements. Ultimately, he found us in his contacts as he had already worked with us for one of his projects. Then, he directly contacted us, described the whole situation about his project and handed-over the partly developed app. We, at Space-O Technologies, have already developed over 40 on-demand delivery apps with different features and functionalities. 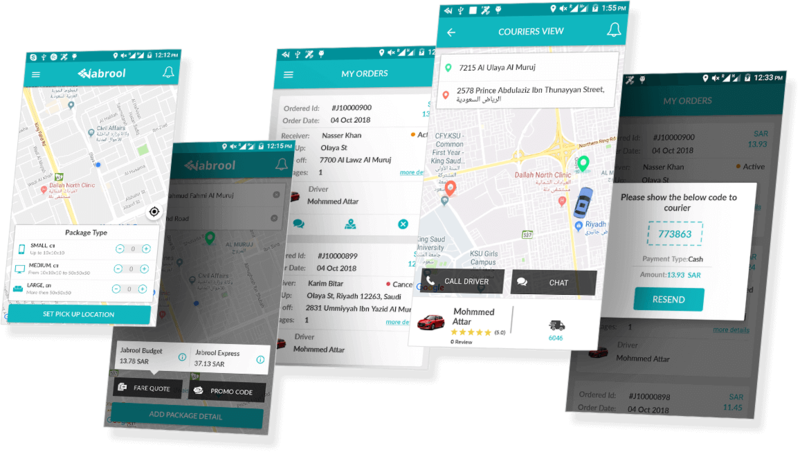 And our client also wanted to develop an on-demand package delivery apps solution, including customer’s app, delivery driver’s app, and admin panel. With the main aim of making it easy and convenient for his customers to get instant delivery services, our client wanted to develop a complete on-demand package delivery solution that provides instant access to delivery services no matter the type and size of customer’s shipment. Through this on-demand solution, our client wanted to connect his customers and delivery drivers in real-time. Initially, we decided to spend some time analyzing the partly developed app and review the code provided by our client. Then, considering our client’s business and requirements, our sales representative made one proposal, suggesting important features and functionalities to include in both the apps. Also, we suggested our client to re-skin the design of both the apps (Jabrool Customer’s App & Jabrool Delivery App) to improve the overall look and feel. After reviewing our suggested features and functionalities, our client instantly got ready for the things we suggested and asked us to proceed ahead. Ultimately, we started designing and developing both the apps that connect drivers and customers. The customer’s app allows customers to transport goods from one place to another across Saudi Arabia whereas delivery driver gets appropriate requests that fit safely in his vehicle. Customers need to set a pick-up location from where they want to make a pick-up of the package or goods. Including the type of package from small, medium and large, customers enter the location. Customers need to add package detail like the type of package, drop-off location, and delivery type as per the need and urgency. Customers will get a price quote as per the type of package delivery. The app shows two delivery types, including Budget and Express. In the budget, the delivery of the package will take some time whereas Express delivery will be delivered on the same day based on the distance. It allows customers to view the previous and current orders or requests under “My Orders”. They can view orders with complete detail like Order ID, date, receiver name, pick-up & drop-off location, no. of packages, and status. Customers can track drivers in real-time and check estimated arrival time. In fact, after pick-up, customers can track the package and current location of the driver. Customers can chat with the drivers through in-app chat option and talk about the package delivery, price quote, and drop-off location. Make a call to the driver with just one single tap. Customers just need to click on the “Call Driver” button and talk about the delivery. Customers get real-time notifications and alerts about their requests, including order confirmation, package delivery alert and other important alerts. Drivers will get a pick-up location of the package. From his current location to pick-up location, he can check the driving direction and estimated time to reach the location. Driver can check the request detail that he has accepted. The driver will get the complete detail about the request like pick-up location, type of package, delivery type, no. of packages, and weight. Drivers will get a new request pop-up that he can accept and decline. In the new request pop-up, drivers can check pick-up location, drop-off location, item description with delivery type, number of packages, and weight. With in-app chat option, the driver can directly talk with the requestor about the package delivery or drop-off location. With just one tap, the driver can start the conversation. In any case, if drivers have any query or confusion regarding the drop-off location, they can directly make a call to the requestor with just one tap on the screen. Drivers will get alerts and important notifications about the arrival of a new request and other updates. Connect with our on-demand app development experts and discuss your requirements. Just book your 30-minute free consultation now. As our client decided to develop Jabrool apps on both the platforms, including iOS and Android, we initiated with the iOS development. For iOS app development, we assigned our Sr. iOS app developer, who has over 4 years of experience, with special expertise in Objective-C, Swift, and CoreData. Our assigned iOS programmer initially spent some time to analyze the partly developed code and understood its structure. After that, he started developing the application as discussed with our client. Sending a new request to the courier. Opening one-time password screen when the courier reaches to pick-up address. Giving smooth chat experience to courier and customer. To develop Jabrool application on the Android platform, we assigned one Android developer, who has more than 3 years of experience in the Android development field. While developing this application, real-time tracking of driver and package feature took much time of our assigned developer. In addition to this, our developer also faced one issue while maintaining a socket connection when any user was returning from the background. Finally, the developer updated the latest code of Socket-IO as our iOS developer did and resolved this issue. Ultimately, the hard work of our mobile app developers shines on the Jabrool Application. Our teams of Android and iPhone developers successfully developed Jabrool apps solution, including required features and functionalities that demanded by our client.